Rustam Babaiev and Evgeny Prudnik are not very heavy sportsmen but it is one of the most interesting matchups of this card because these guys is battling each other for years. They pulled at 80 kg class on Worlds. Rustam was unbeatable and Prudnik was first to stop him. If we analyze this fight, we should begin with start explosiveness. My thoughts: starting explosiveness is a favor of Babaiev but Prudnik is very good at stopping him. Probably Evgeniy will find out how to stop Rustam in six rounds but 2-3 rounds starts is for Rustam. In a supermatch format when you get more tired and lactate builds up you get slower, so for first few rounds explosiveness is very important. The second thing is endurance. I guess it’s Prudnik’s favor. We can remember the longest match in armwrestling history between Prudnik and Girard. Prudnik can pull long time, I didn’t saw him tired. But in a fight with Bresnan Babaiev didn’t lose much power in late rounds, he still can pull great in the supermatch, he knows how to prepare. Technique. I want to say Prudnik this time because he can pull different styles and Babaiev uses hook mostly. Rustam is very strong in his movement despite the short levers but Prudnik can pull hook, toproll and even triceps. So even if I say that technical they are equal, if Babaiev loses in first round using his style, could he be able to switch to other style? But few years ago at Senec Hand he won Kostadinov with a toproll. Tactical experience. They both pulled in a lot of supermatches but lately every year Babaiev had more supermatches than Prudnik. 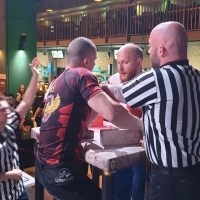 He is envolved in top-level armwrestling around 20 years, so this point is Rustam’s favor. As a conclusion, I will say 4: 2 for Prudnik. Rustam Babaiev vs Evgeny Prudnik is a long time awaited Vendetta. Rustam has beaten Evgeny all the time until 2013 Europeans when Evgeny finally defeated him after unforgettable battles in the final. But Evgeny was giving signals of beating Rustam even before that time. For example, 2010 Europeans Evgeny gave Rustam a solid battle of 50 seconds. After 2013 Rustam left the sport for some years and now he is back again for the last a few years. I saw these athletes in Moldova event last year where Rustam defeated Evgeny in 95kg class and Evgeny defeated Rustam in the overalls. I believe that an obvious prediction of this match is that if Rustam wins he will have to do this quickly as any match that stops will be in the favour of Prudnik because of his better endurance. Rustam is powerful but his endurance is not as great as his explosiveness. I don't know the current shapes of the athletes but i believe that Rustam will win the early round or even maybe a couple of rounds. But not sure if he will win enough to win the Vendetta. Devon Larratt: I think Prudnik will win, because he’s more versatile and can hang with Babaiev in strength.